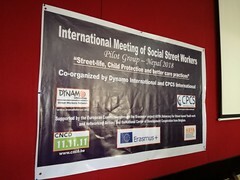 As we had already announced in a previous article, the Dynamo International Street Workers Network (DISWN) Pilot Group took place in Katmandu, Nepal, from October 22nd to October 26th. For almost a week, 43 participants (a number never achieved before !) from 34 countries sat down together in order to reflect on social street work, share good practices and… discover the Nepalese culture. Here is the overview of DISWN members’ 18th meeting. The Pilot Group began with an advocacy day. Moments of joy (young Nepalese performed plays, danced and sang for the audience) succeeded the numerous speeches given by national and international political figures ans representatives of civil society. Edwin de Boevé, director of Dynamo International, and Gauri Pradhan, former member of the Human Rights Committee and founder of the Child Workers in Nepal Concerned Centres underlined the dramatic conditions faced by millions of children in street situation across the world. They also insisted on the importance of social street work to tackle those issues. During the following days, the members presented the overview of what happened within the last 2 years, following the last GP in Dakar, they approved the Network’s strategy for the 5 years to come, and also acknowledged the closer relationship established with the Lions Club International Foundation. What should be remembered from this GP? Many topics have been discussed throughout the week, let’s highlight the most significant ones ! The term describes the platforms which did not honor their obligations towards the Network for at least 2 years (see internal rules). Each one of the 4 regions from the Network (Africa, America, Asia and Europe) have taken a position of their own regarding this issue. Asia is the least expanded region. Thus, the platform is not facing this problem and considers that there is no ghost platform. Europe suffered a downturn for a while, mostly because many members were going through internal changes. However the regional coordinators consider there is no ghost platform given that all the organizations kept being very active locally. The African region has 16 members officially but only 7 of them are truly active. However, the decision has been made not to exclude anyone for now. An official mail will be sent to the unresponding platforms. 4 platforms have been excluded from the American region : Peru, Nicaragua, Guadeloupe and Colombia. Martinique still seems to be very interested although they’re no longer taking part to the regional meetings, therefore decision has been made to wait until the next GP before excluding the island or not. Guatemala is represented by Siembra Bien, a local youth organization. Ecuador is joining the Network through Unidad Patronato Municipal San José, a municipal service from Quito, the capital city, which helps people in need. Lituania has been accepted thanks to the application form submitted by the Vilnius Social Club, a youth organization, from Vilnius, the capital city. Iceland is joining the Network but is not represented by any official structure. Therefore, there is no website to be shared. Israel, where Elem, the member association is helping the most vulnerable. A themed working groups system has been set up and used during this Group Pilot. What for, you might ask ? To fully exploit the potential of such an extended network (12,000 social street workers in 3,500 organisations, 51 countries in 4 continents) when it comes to sharing knowledge. The aim is also to ramp up the joint initiatives and to achieve the network’s decentralization. If you’re part of the Network and you’d like to join a themed working group, feel free to contact the leaders ! Under the guidance of Pierre Van Den Bril, the Network’s experts are expected to modify the internal regulations. Their new article concerning the membership applications should be submitted during the next Pilot Group. Furthermore, the term “expert” should be replaced in the future so they would be referred to as “consultants” or “resource people”. 3 new experts officially joined the Network : Valbona Hystuna (Greece), Philippe Roux (France) and Henk Geelen (Netherlands). Since 2017, the Street Workers Training Institute (SwTI) has been managed by Conversas Associação International (CAI), the Network’s portuguese platform. The SwTI based in Lisbon, develops numerous advocacy, training and awareness projects, some of them funded by the European Union such as the Asya project (2017-2019), coordinated by Asociacion Navarra Nuevo Futuro with Erasmus+. It brought together 6 Asian countries (Nepal, the Philippines, Vietnam, Hong Kong, East Timor and Cambodia) in parallel of the GP’s workshops. Nepal, the Philippines and Vietnam are already part of the Network while the 3 others are yet to become members. Hong Kong et East Timor have already submitted their application form. What’s next for DIWSN ? Regarding the next challenges for DISWN, changes are to be done on the Internal Rules. 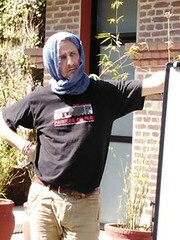 The modifications should be submitted by the technical team during the next meeting. It would give the regional committee more power over the application requests they receive. Until now, only the Pilot Group could decide who was accepted in the Network, so applicants had to wait 2 years before getting an answer. The Pilot Group has also agreed on establishing compulsory contributions, required to be a part of the Network. Therefore, it has been decided that the technical team will have to systematically send reminders concerning those contributions and/or receipts when they’re fully paid. Furthermore, the next Pilot Group will be organized alongside the Words from the streets forum, a space for exchange and advocacy centered around social street work. The third edition will take place in Brussels in 2020. Hosting those 2 events at the same moment would give a much better visibility to social street workers’ impact across the globe.